Offered Today Is A Beautiful Faux Gemstone Necklace For A Woman To Wear. It Is New And Never Worn. The Chain Is Silver Plated. All Stones Are Faux But Nicely Done and Of Good Quality. They Come From A Clean, Non-Smoking Home! 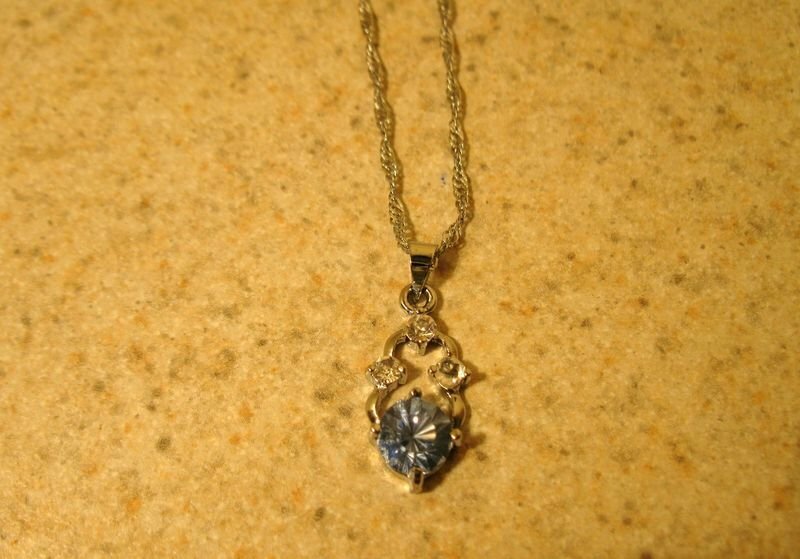 #272 SILVER FAUX BLUE & WHITE TOPAZ SOLITAIRE- This Necklace Has An 17 Inch Silver Plated Chain. There Is A Single Solitaire Faux Blue Topaz Stone With 3 Small White Topaz Stones On Top. All Stones Are Faux But Nicely Done. The Stones Are Very Rich And Pretty. New Without Tags. Thank You for Shopping With Me. Please Take The Time To Look At My Other Items For Sale And Add Me To Your List Of Favorite Sellers. I Hope That You Had A Positive 5-Star Experience When You Visited With Me Today. Your Positive 5-Star Feedback Is Appreciated. Comes From A Clean, Non-Smoking Home! Note: I Will Ship Internationally Only If Your Country Allows This Item And It Is Not Restricted. Contact Me Beforehand To Find Out If I Ship To Your Country And The Shipping Charge Amount. A $1.00 Handling Charge Will Be Included With Your Invoice For All International Sales. You Will Be Responsible For Any Fees Or Charges That May Occur In Your Country.